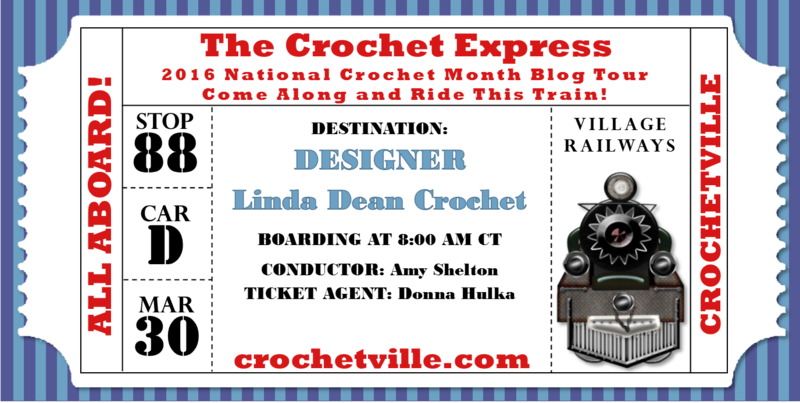 Welcome to my post for the annual National Crochet Month Blog Tour hosted by Crochetville.com! I am honored to have been participated in the last 5 years of this tour event, and this year theme is “Glamping”…or Glamorous Camping, every day in the month of March Crochetville.com has visited designers, yarn stores, and had various giveaways…don’t miss a stop of the tour. I cannot say that I have done much crocheting while camping…honestly, I have not been camping in years. I live a rural life, and have lost count of the days I spent camping as a kid, so I vacation now in a bit more of a “modern” style…someplace that offers room service. To celebrate National Crochet Month I have a free pattern to share with you as well as a discount at my Ravelry.com store (use coupon code NatCroMo2017 and receive 25% off any and all patterns). 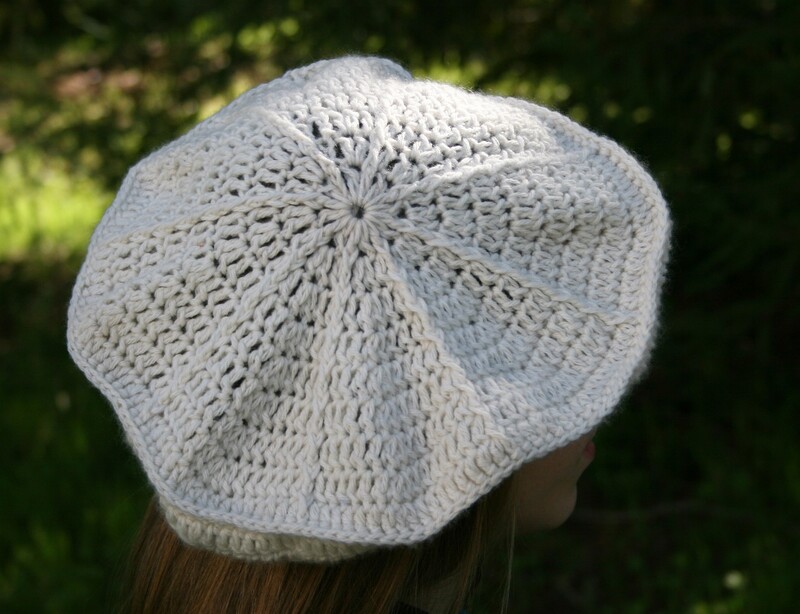 The Spokes Tam is a simple beret hat dresses up your Glamping adventure with a bit of style. You can really use any weight yarn with an appropriate crochet hook, but I have listed what I have used below. 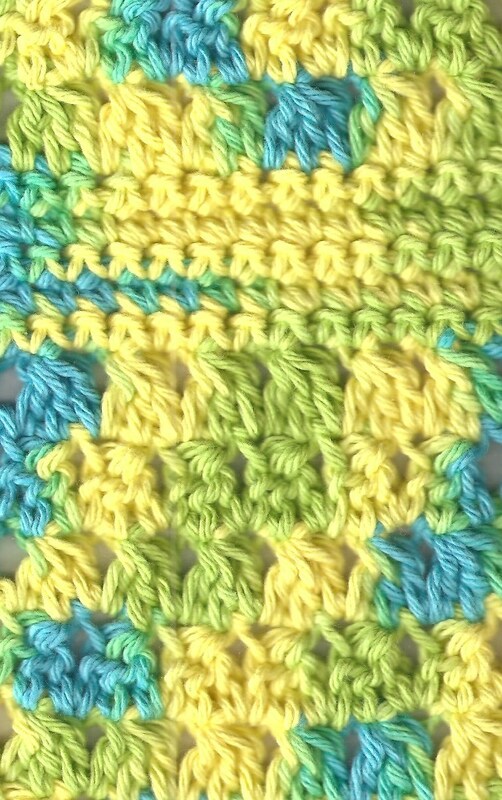 Special note: All Front Post Double Crochet (fpdc) after Round 2, are worked around fpdc the row below. Front Post Double Crochet (fpdc): Yarn over, insert hook from front to back and then to front again around post of stitch, yarn over and draw up loop, [yarn over and draw through 2 loops on hook] twice. Front Post Single Crochet (fpsc): Insert hook from front to back and then to front again around post of stitch, yarn over and draw up a loop, yarn over and draw through 2 loops. Double Crochet 2 Together (dc2tog): [Yarn over, insert hook in next st and draw up a loop, yarn over and draw through 2 loops on hook] twice, yarn over and draw through all 3 loops on hook. Rnd 11: Ch 3, turn, dc in next 6 sts, dc2tog over next 2 sts, [dc in next 7 sts, dc2tog over next 2 sts] around, sl st to join. Rnd 12: Ch 3, dc in next 5 sts, dc2tog over next 2 sts, [dc in next 6 sts, dc2tog over next 2 sts] around, sl st to join. Rnd 13: Ch 3, dc in next 4 sts, dc2tog over next 2 sts, [dc in next 5 sts, dc2tog over next 2 sts] around, sl st to join. Rnd 14: Ch 3, dc in next 3 sts, dc2tog over next 2 sts, [dc in next 4 sts, dc2tog over next 2 sts] around, sl st to join. Rnd 15: Ch 1, turn, sc in each st around, sl st to join. Rnd 16: Ch 1, turn, sc in each st around, sl st to join. Fasten off. Enjoy a Celebration of Crochet! Don’t forget to use coupon code NatCroMo2017 and receive 25% off any and all patterns at my Ravelry.com store until April 15, 2017. 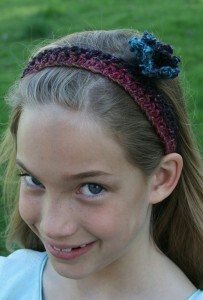 Check out all the stops on the Crochetville.com tour for more free patterns, discounts and fabulous ideas! 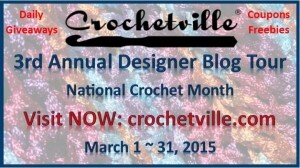 Crochet Month Celebration- Free Pattern & Discounts! 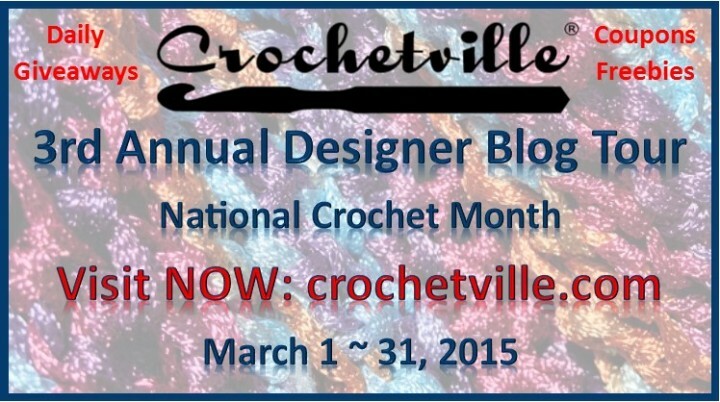 I can hardly believe that a month long celebration of crochet is really almost over. 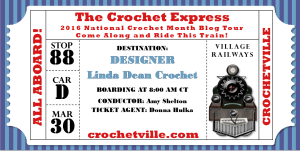 Crochetville put together quite the blog tour this year and I am grateful that they have invited me to attend again this year, (if you have missed any stops, make sure and check them out here). I will admit that I have found it fun to see the focus on various social media outlets about Crochet Month, but in my personal reality nothing changed too much as crochet is my everyday celebration. I find a little something that fascinates me with this craft nearly daily. It may be the fact that there are so many different locations to place a stitch and get such a different effect that it is almost too numerous to count. It may be that the same pattern worked in a different yarn or with a different fiber can create a completely different look. It might also be that if you just change your hook everything can change. It might seem like small details, but these small details can make all the difference. 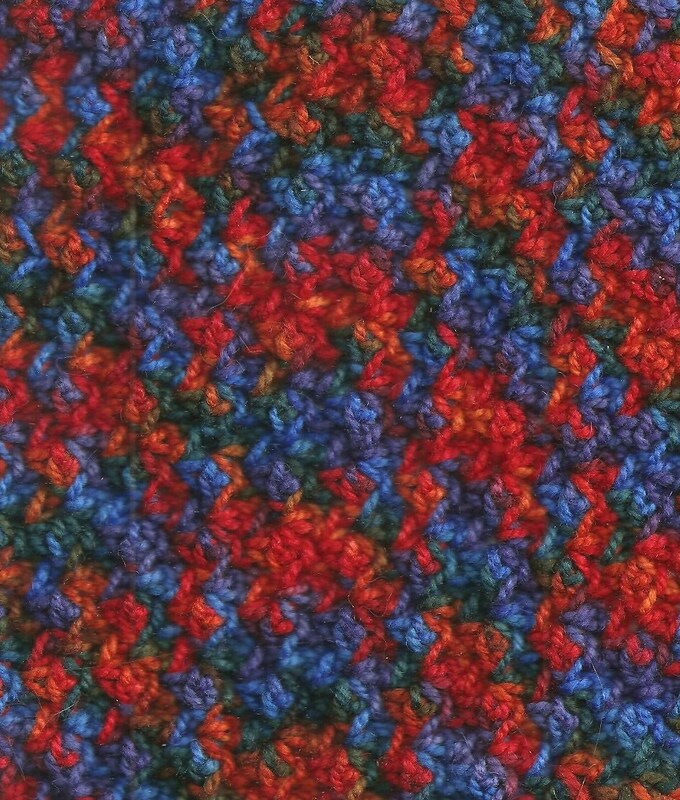 I know I probably sound like an artist that is explaining different shades of red, because the most important thing about crochet is the way it makes you feel to create. 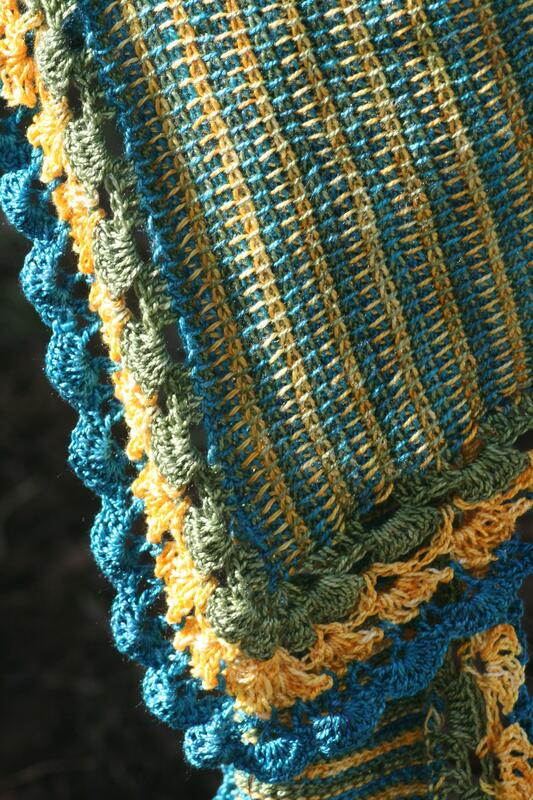 My personal soap box is that there is never “wrong” crochet, because if you enjoy it, that is all that matters. A statement that I students always enjoy is “If your friends point out your crochet mistakes, they are not your friends”. 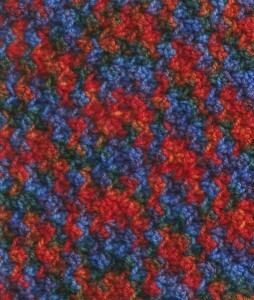 To aide your enjoyment of the crochet celebration, I am sharing a free pattern. 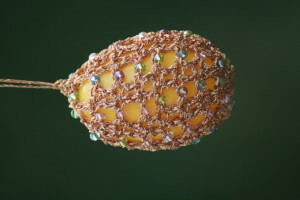 This pattern, The Small Empress Jeweled Egg, may be a little late for the Easter holiday, but as you may have the plastic eggs around, and these are cute additions that you can use for spring decorations. 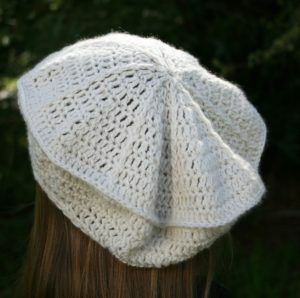 In addition I am giving a free pattern coupon for my Ravelry store. Buy any patterns totaling at least $9 and receive your choice of any pattern FREE by using code NatCroMo2016 until April 6, 2016. Also, I am excited to share that I am teaching at the annual Crochet Guild of America conference, known as Chainlink in some crowds and the Knit & Crochet Show in others, this July in Charleston, SC. If you plan on attending, please consider my classes. I would love to meet you there! Don’t forget to check out all the other stops today on this ride along the blog tour, places like my friend Vashti Braha, I always love reading what she has to say. If you need some help or ideas for using beads, check out some of my tips here. Small Empress Jeweled Egg I do not know why the photo wants to be on its side…. 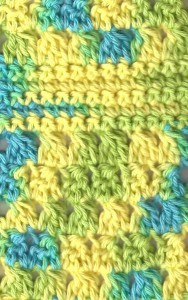 Bead Crochet (bc): Slip 1 bead to hook, YO, pull through loop on hook. Double Crochet 2 together (dc2tog): YO, insert hook into indicated stitch, YO and pull through, YO pull through 2 loops, YO insert hook into next indicated stitch, YO pull through, YO pull through 2 loops, YO pull through last 3 loops. Insert small egg and work subsequent rounds. Round 9: Ch 1, sc8tog in all dc sts, finish off. Spring is in the air; the ground is beginning to warm and release the blooms of daffodils. The days are getting longer and spending time outside is a greater joy. So it has made it a nice time to release 2 of my latest designs, they help take a little chill out of the air and dress up a casual look. 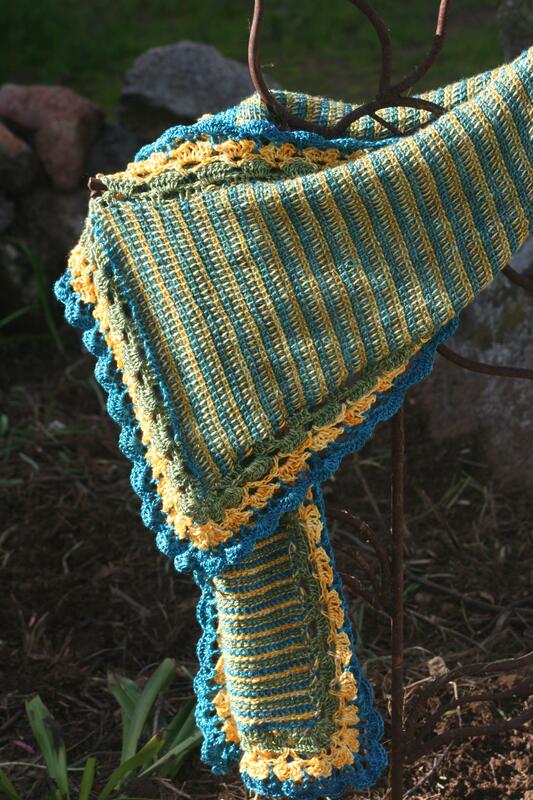 The first is the Summer Rays Drop Stitch Wrap; it is created with a simple 3 row repeat, and 1 skein of Lisa Souza Sylvie 100% Bombyx Silk yarn. 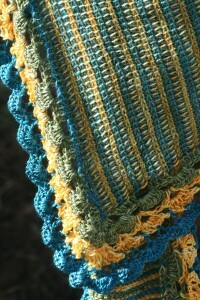 The highlight of this wrap is a unique stitch that is created free hand, of long loops, a technique that was originally featured in my article in the Summer 2012 issue of Crochet! 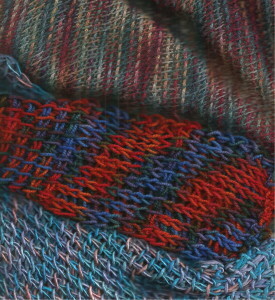 Magazine, with the Drop Stitch Short Scarf. I really enjoy this technique as it gives the appearance of hairpin lace without the loom, or the joining of strips. It is worked as one continuous piece, and when you finish, you only have 2 ends to weave in. 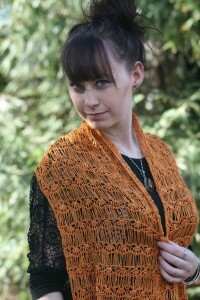 This pattern includes the details on how to complete this technique, and I have to say that the silk gives it such a great drape that it adds elegance to the work. What inspired me to put this design together was actually the yarn. 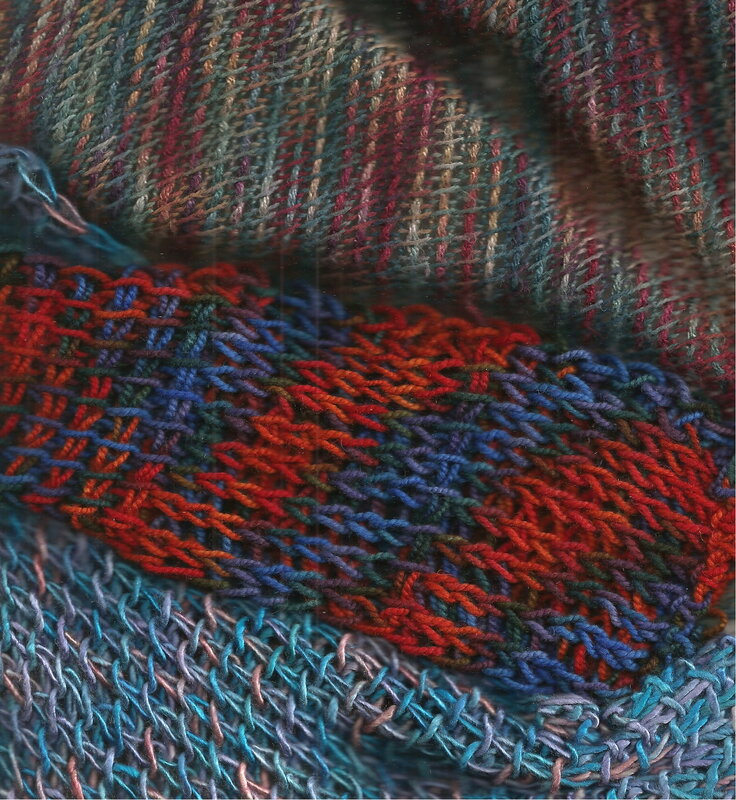 I had a skein, and I made it a personal challenge to see what I could create with it, and the Drop Stitch lends itself to this non-stretch yarn very well. The openness of the stitch with the smooth surface of the yarn, allows both to be featured in a positive way with this design, creating a classic style. The second design I am releasing is the Honorable Mention Winner of the 2013 Crochet Guild of America Design Contest, Accessories category; the Fiji Flowers on Flowers Shrug/Wrap. This is a uniquely constructed piece that is comprised of 3 large pentagon motifs created with Tunisian Crochet. These motifs create a negative space design that is enhanced with additional motifs, thus creating flowers inside of flowers. All motifs are joined as you go, requiring no sewing. One of the original features of this design is the “floral buttons” these are added embellishments that allow the fabric to be secured together to create air sleeves of a shrug, or left unsecured for an interesting wrap. 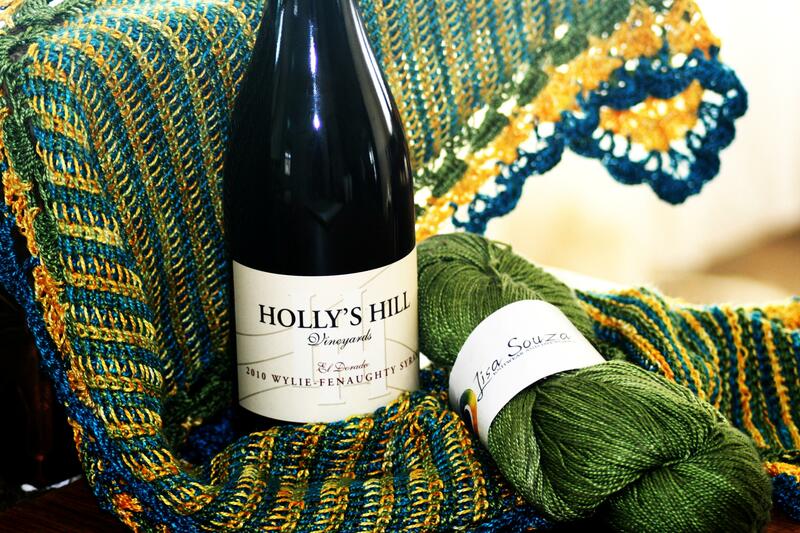 This versatile piece is also worked in Lisa Souza Sylvie 100% Bombyx Silk yarn, which has beautiful color and gives great drape to this piece. This is a fun shrug that can be paired with jeans or a simple black dress, can be a nice compliment for a day at the beach, or a night on the town. It fills a very unique niche in any wardrobe, and trust me, it is fun. My inspiration for this design was born out of a watermark I saw in a magazine advertisement. It was a flower that was actually featured in a negative space (the space that is not the color, but the blank background), and I began daydreaming of how to create this in crochet, thus the large motifs were created. However they lacked structure and did not allow for a stable fabric, until the addition of contrasting motifs within them. This the negative space flower grow to have an addition of flowers within its petals. Both of these designs are available for sale on Ravelry.com or Crochetville.com for the simple price of $5. 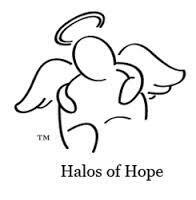 Check them out and let me know what you think of them.